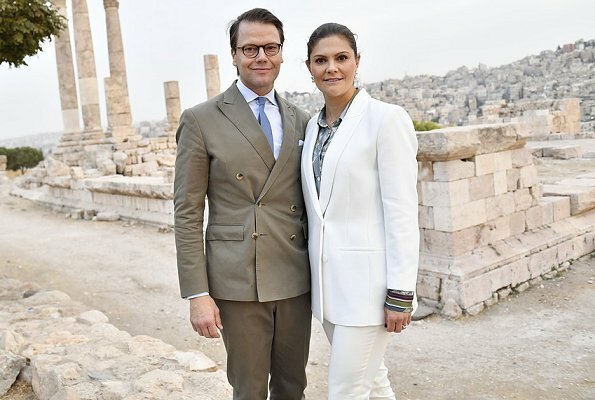 Crown Princess Victoria and Prince Daniel are making a 3 day visit to Jordan on October 15-17 with Minister of Children, Elderly People and Gender Equality, Lena Hallengren. 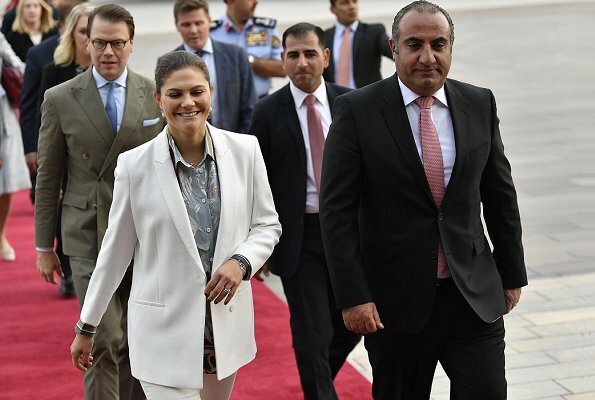 The Crown Princess Couple arrived at Marka International Airport in Amman on October 15 and the Couple was welcomed by Governor of Amman. The royal couple visited Amman Citadel and Roman Theater. The aim of the visit is to strengthen the good relations between two countries, to emphasize UN sustainable goals in 2030 Agenda and to focus on gender equality, climate and humanitarian issues. The Crown Princess Couple will visit Beirut, Lebanon on October 17-19. 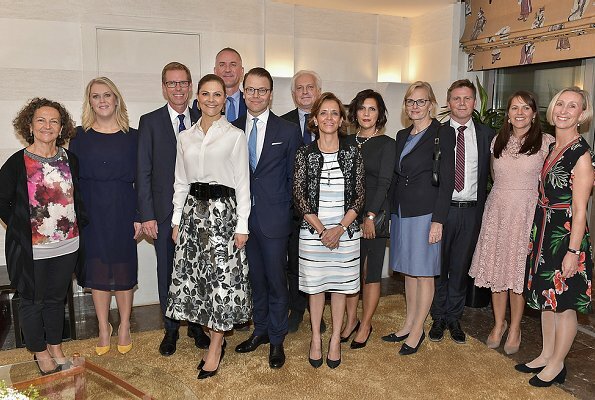 Crown Princess Victoria and Prince Daniel attended a dinner at the Swedish Ambassador's resident on the first day of their visit to Jordan. Good colour coordination in the couple's clothing, eve matching the sandy background, but I wish Daniel would stop wearing these ill fitting double breasted suits. Yes, Beth! Daniel's bouble breasted suits are terrible. Maybe he is secretly related to Charles, Andrew and Edward. Victoria really looks great here. I prefer her jacket unbuttoned. It looks great with the fitted slacks. She has chosen a really nice blouse to break up the color. Il nous a enfin entendu ! Sur la dernière photo il porte un veston d’un seul boutonnage. No crown prince or prince to welcome them at airport? or is it a privet holiday for them ?I mean are they come as tourists? Jordan is beautiful in October and has a lot to see and enjoy.Have a wonderful time . It's not a holiday trip but it's neither a state visit. Its a business trip you can say! Classy today! again. Love the blouse never seen this one before. Hope both have fun on a working tour. They both look somewhat off. His suit doesn´t sit right (although I like both the colour and the style as such); he needs a larger size, he needs to close more buttons (especially the ones on the inside to stop the pulling), and he has to brush up on his tie-tying skills. She looks too casual for a formal welcome ceremony, and her suit doesn´t sit right either: jacket´s too lose, trousers too tight. Not sure about the white either, has vibes of both lab coat and high-society-at-yacht club. The colour of Daniels suit looks very good on him! She always looks so pulled together!! Love this suit and blouse! !